Sharpening a bread knife or any other serrated knife requires a different technique to sharpening a straight edged knife. It is easy to see why – on a serrated knife, each serration has to be manually sharpened individually. However, sharpening your bread knife need not be as time consuming as this. There are 3 main ways you can go about sharpening a serrated knife depending on the tool that you wish to use. For instance, many modern electric sharpeners are actually designed to accommodate serrated knives. If you go down the manual sharpening route, a reliable ceramic sharpening rod will likely to be your tool of choice. Another way to sharpen a serrated bread knife would be the ‘manual assisted’ method. The Spyderco Sharpmaker is one of the best options for this. Further down the page you will find detailed information on all 3 methods of sharpening a serrated knife. First however, you can view our top recommendations in the table below, to ensure that you have the best tool for the job before you begin. As we have already mentioned, to manually sharpen a serrated knife you will need a specific tool that can get inside those grooves. Ceramic (and diamond) rods are one of the most popular methods of manually sharpening a bread knife. 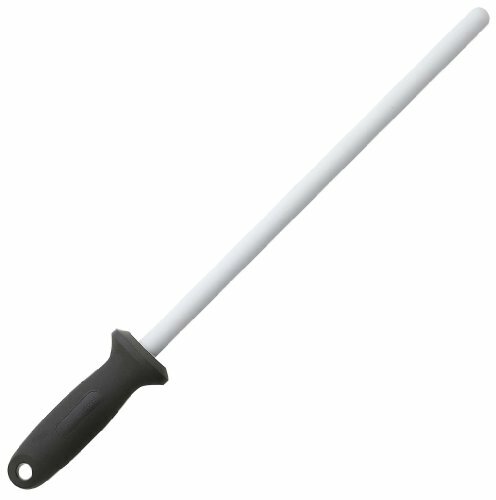 The rod shape is designed specifically to get inside the serrations of the blade. This allows you to sharpen your knife tooth by tooth. The Messermeister takes our top recommendation spot because it really is a strong, high performing ceramic sharpener. The rod is built from industrial strength ceramic combined with an alignment steel that will sharpen your dull serrated edges in just a few strokes. You can check it out on Amazon here. Most serrated knives, whether it is a bread knife or a sports knife as seen in the image above, will have a one sided bevel edge. 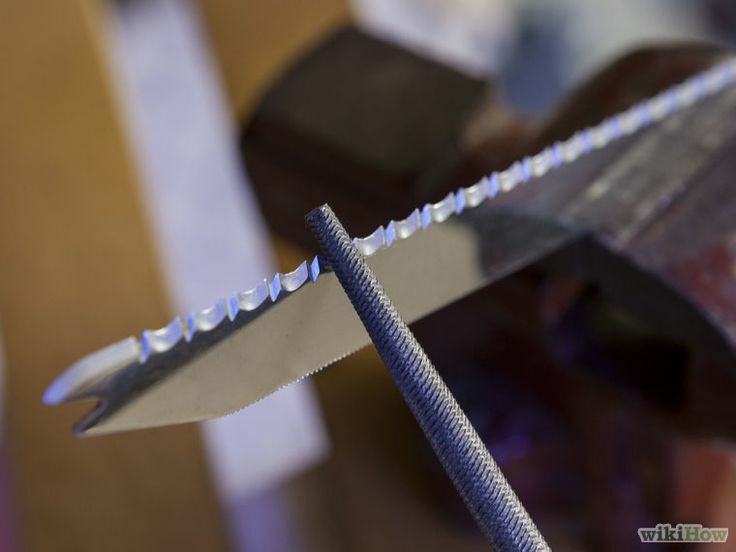 The bevel-edged face of the blade will angle slightly on the inside of each serration. (Using the image as an example, the bevel edge is the top side up). 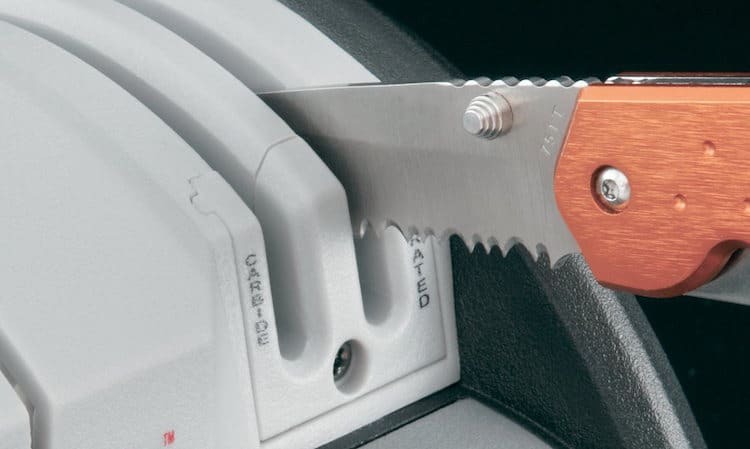 You should only ever apply the sharpening tool to the beveled edge of your serrated knife. The rod needs to be kept a very shallow angle (see more about angles at the bottom of the article) in line with the beveled edge. 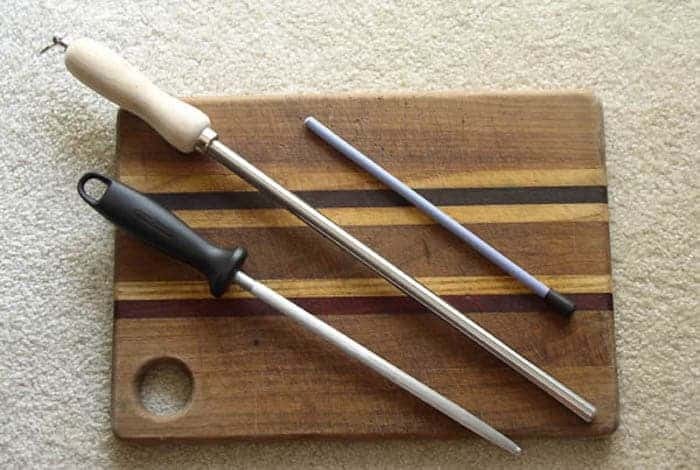 If you are using a tapered sharpening rod, you will be able to align the rod at a position where it is the same diameter as the gullet, therefore filling the groove completely. First ensue you are will be using the sharpening rod through the bevel edge of the blade. Then using smooth, short strokes, run the rod through each groove of the knife. You should always stroke away from the blade so as not to potentially harm yourself. Each groove should only require a few passes of the rod. 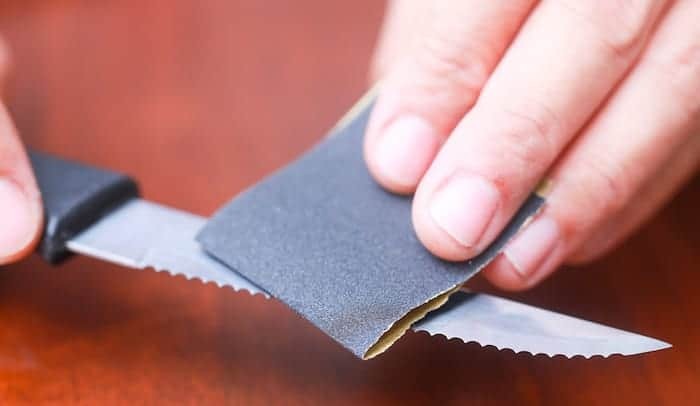 Once you have sharpened a groove, you should check the other side of the knife for any metal shavings, (or what is otherwise known as a ‘burr’). The best way to check this is to run your finger alongside the blade. Continue to sharpen each groove on the blade, ensuring to adjust the rod to fill the diameter of any varying gullets. You can easily remove the burr after sharpening by moving the knife carefully over the edge of sharpening stone. Alternatively you can rub the back of your knife against a sheet of fine-grit sandpaper. Some knives are partially serrated, meaning that a section of the knife will have a straight edge to it. To take care of this area of the knife you will need to use a whetstone or other sharpening tool. Never use a serrated knife sharpening rod on the straight edge of the blade. Nice work, you have now successfully manually sharpened your serrated knife. Ensure to take care of your knives regularly enough so that they do not become dull. 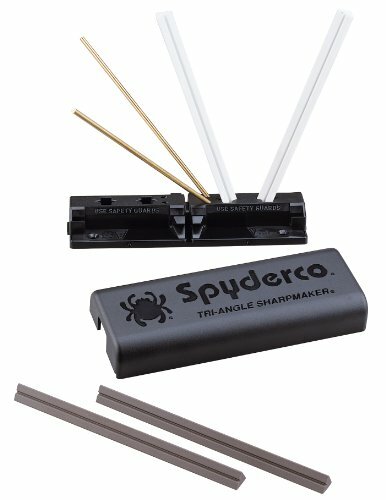 We here at Sharpen-up highly recommend the assisted manual approach of using the Spyderco Sharpmaker. It is possible to achieve a razor finish to both straight edge and serrated edge knives with the Spyderco, and it is very easy to use. Basically, the tool uses a set of ceramic stone rods that are placed into a base in a V angle that measures 40 degrees. All you have to do is keep the knife straight as you move it up and down the rod to sharpen it. 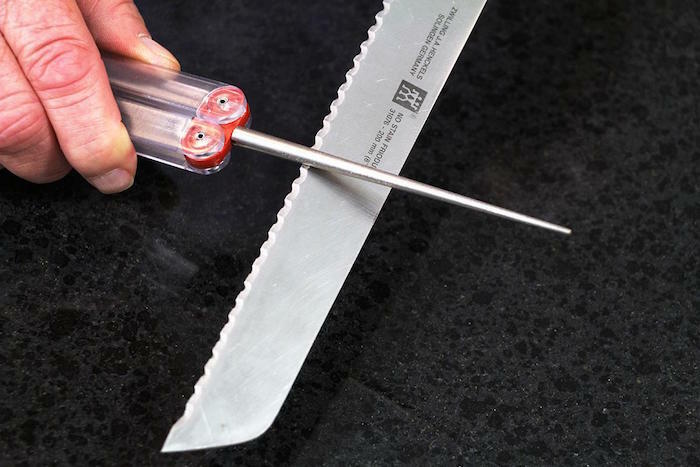 This removes the major hurdle of selecting the correct angle from manual knife sharpening. You can check current deals on Amazon here. There are a number of electric sharpeners available that can sharpen both straight edged and serrated edge blades. When shopping for an electric sharpener, it is generally a case of looking out for the number of sharpening stages that the product has and whether it can accommodate your serrated bread knife. Electric knife sharpening is all about convenience, speed and ease of use. 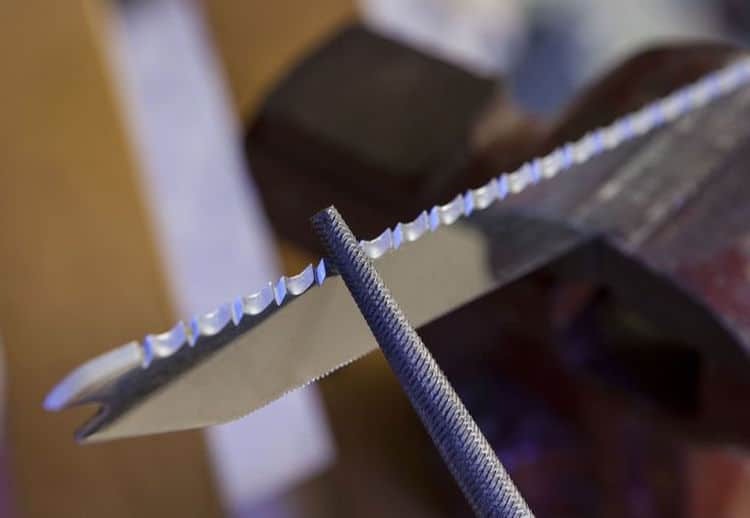 To sharpen a serrated blade you quite literally pass the blade through the appropriate stage and let the machine do the work. 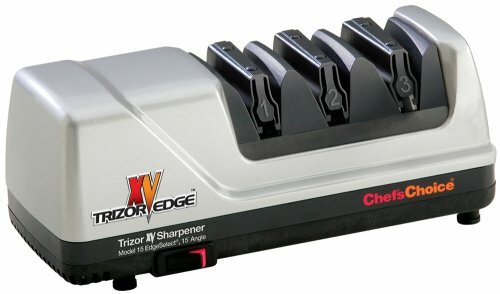 It is hard to fault the Chef’s Choice 15 Trizor XV EdgeSelect. It is one of the most versatile electric sharpeners out there, and at a very good price too. 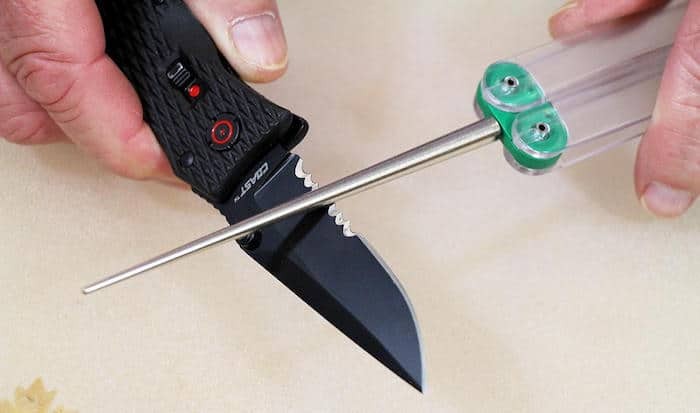 The beauty of the Trizor is the fact the stages contain flexible spring guides that automatically adjust for the proper angle as you run the knife through any pass. An excellent electric sharpener that comes highly recommended. Your bread knife will be razor sharp in no time. You can check latest prices on Amazon here. If you intend to manually sharpen your bread knife using a ceramic rod you will need to understand what angle to use. The fact is, finding the angle on a serrated knife is easier than you would imagine, as the serration gives such a clearly defined bevel. By placing the sharpening rod flush within the bevel, you will automatically have your correct angle. However, a common issue is actually maintaining that angle through out the sharpening process. Serration bevels although defined, can be quite shallow, (sometimes as low as 13°-17°). This means that you generally need to keep a close eye on the angle as you sharpen manually. Checking for a burr should be done by running your finger perpendicular to the edge, not along the edge as suggested in the article. You’re feeling for a fine “wire edge”, or beard, that has been pushed up on the backside of the blade from where you were sharpening. Running your finger along the edge is a good way to cut yourself since the burr is likely to be quite sharp (and may be a bit “toothy” as well).